Preheat your oven to 190C or gas mark 5. Rub the flour, sugar and butter together with your hands until the mixture resembles breadcumbs. It is very quick to do by hand but you could use a food processor if you prefer. Add enough egg to bring to bring the mixture to a stiff dough. YOu only need about half an egg. I think next time I will make a double quantity to make use of the whole egg. I can always add a little milk if it isn't wet enough. Shape the dough into a sausage shape, it needs to be about 5cm thick. Now cut this into 12 rounds and lay them down on a baking tray (they do spread). The tray doesn't need to be greased. 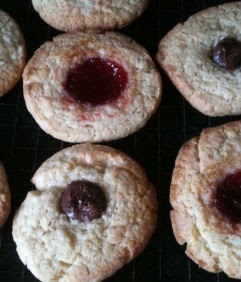 Make a small indentation in the middle of each biscuit either with the end of a wooden spoon or your finger. Add a drop of jam or lemon curd in the centre. Bake for roughly 12 minutes, they should be risen and golden in colour. Pop them onto a rack to cool. The original recipe from BBC Good Food used jam as the filling. As you can see from the photograph, we tried chocolate spread. It was the Nutella brand, it didn't melt/spread across the biscuit, not very nice in my opinion. I have just made another batch for our picnic tomorrow and added lemon curd. Don't tell the children but I stole one, big thumbs up for the lemon curd, they are delicious.